1. Place the chicken thigh chunks in a bowl with half the oregano, cumin seeds, chilli flakes, most of the lemon juice and 1 tbsp of oil. Season and set aside. 2. Heat the remaining oil in a large non-stick frying pan and fry the aubergine chunks for 15 minutes over a medium-high heat, turning regularly until tender and starting to give up the oil they absorbed when you first put them in the pan. 3. For the caponata, remove the aubergine from the pan with a slotted spoon and set aside. Add the onion to the pan and fry for 5 minutes until softened, then add the garlic and fry for a further 30 seconds. Return the aubergine to the pan with the tomatoes and the rest of the oregano. Season well and simmer for 10-15 minutes, then stir in the parsley. 4. Meanwhile, heat a griddle pan over a medium-high heat. 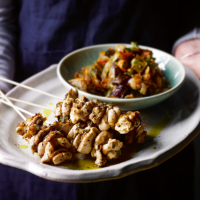 Thread the chicken chunks onto 4 skewers and griddle them for 8-10 minutes, turning occasionally until the chicken is thoroughly cooked with no pink meat and the juices run clear. Squeeze over the remaining lemon juice and serve with the caponata.